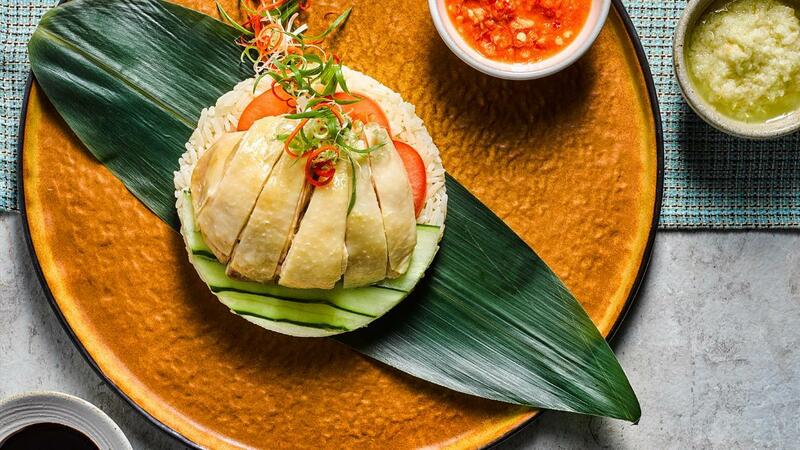 Create this iconic Singaporean dish that will leave your dinner guests raving and craving for more. Bring chicken rice to greater heights with chicken bouillon and Knorr Chicken Seasoning Powder, and turn your guests into ardent fans of chicken rice. Trim cut off chicken feet. Wash and clean up innards. Pat dry and put aside. In a pot, bring water to boil. Add in spring onion, ginger and simmer. Add in chicken and poach for 45 minutes with pot covered. In a pot, heat up oil and stir fry ginger, spring onion and coriander stem till fragrant. Add in water and soya sauce and bring it to boil. Add in rock sugar and lastly finish it with sesame oil. Wash the rice, lay it onto insert. In a blender, blend shallots, garlic and oil together to form a paste. In a pot, sauté the blended paste till aroma is released. Add in blue ginger, lemon grass, young ginger and pandan leaf. Sweat mixture till aroma is released. Add in water, bring it to boil, add in Knorr Concentrated Chicken Bouillon, Knorr Chicken Seasoning Powder and rock sugar. Transfer stock onto the rice tray and steam it for 40mins. After rice is cooked, remove lemongrass, ginger and pandan leaves. Mould rice onto plate, place slice cucumber on top of the rice. Drizzle soya sauce over the portioned chicken. Garnish the portion chicken with chili and coriander.